Note: Not ranked, but famous name. Saddle: Just south of the peak at North 61:25.969, East 008:08.979, elevation 1939 meter. How to get there: See the description for Uranostind, 2157 m.
Route description: From the saddle north of Uranostind.html climb north along a ridge that starts out pretty broad, but narrows as you get higher. The ridge is never difficult and the climb takes about 15 minutes. 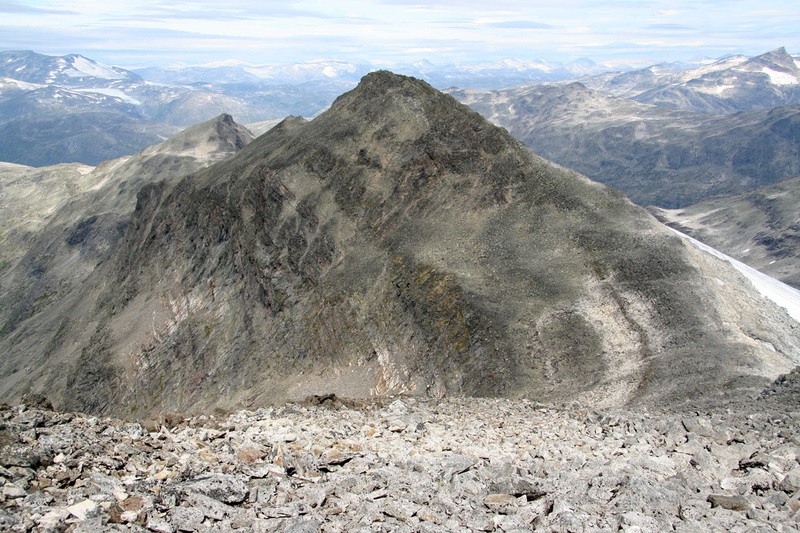 For a description of the route to this saddle, see the Uranostind entry. Comments: I climbed this subsidiary peak after descending to the saddle from Uranostind. The climb took about 15 minutes from the saddle south of the peak. 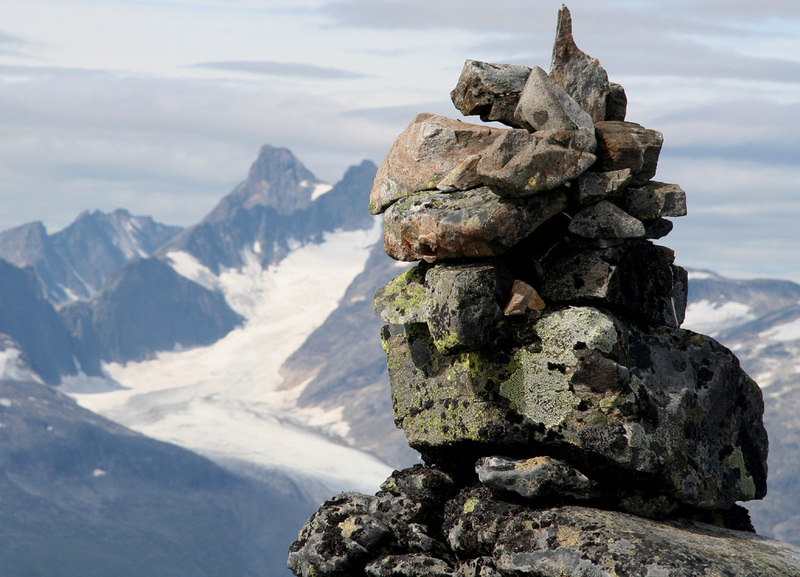 This peak is named after the famous William Cecil Slingsby (1849-1929), English mountaineering pioner, often credited as the father of modern mountaineering and rock climbing in Norway. As such, I felt that this peak deserved a visit as well as a separate entry in my list of mountains, despite being really just "a hump" on the ridge that continues further north from Uranostind. Slingsbytinden, as seen when descending from Uranostind. 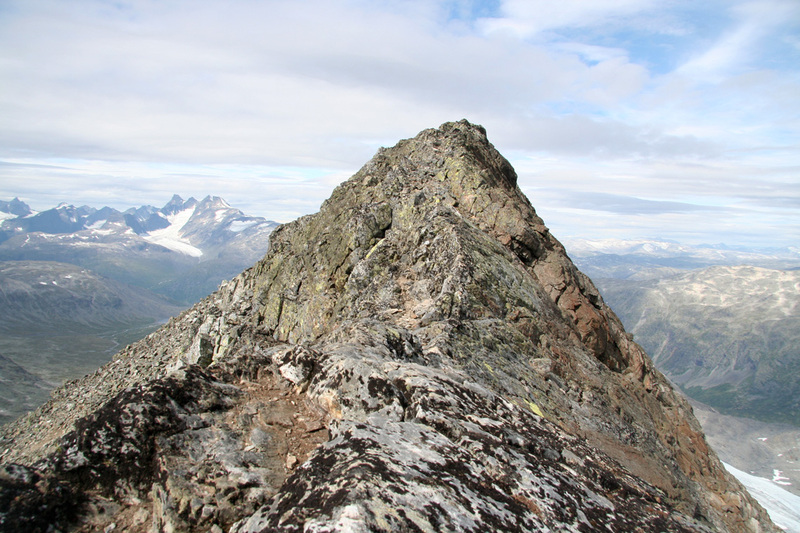 The top ridge of Slingsbytinden. The summit cairn. Storen, first climbed by Slingsby in 1876, can be seen in the distance.